You know it's coming, but this sensor hat developed by altLab for their hack project at Codebits 2011 will give you a better idea of just how unpleasant your morning will be the day after eating spicy foods. 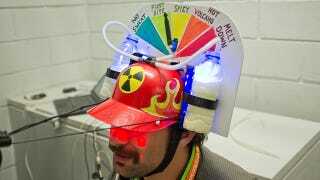 Inspired by the nuclear taco eating challenge at the previous year's Codebits, as well as those beer helmets, the team at altLab wondered if a piece of headgear could be devised that would measure just how hot spicy foods are. What they came up with was the Nuclear Taco Sensor Hat, complete with a bottle of milk and yogurt on each side to help quench the fire.